This page has some of the "rough" work that was done in those first two years. There aren't too many pictures since I had no idea at the time how important "before" pictures would be. Anyway, here's what there is on reinforcing the beams, removing / moving lally columns, and moving ductwork. 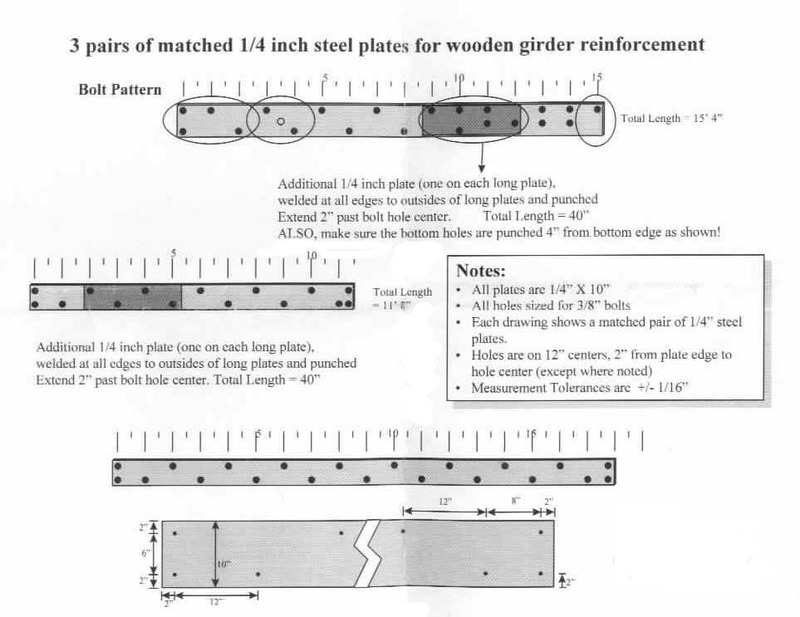 Here's a scan of what I gave the steel fabricators based on recommendations from several structural engineers. 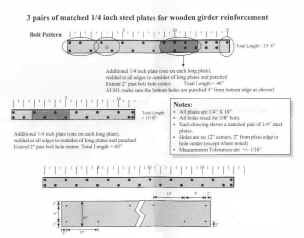 The idea is to sandwich the existing wood beams with quarter inch steel plates so that I could remove two lally columns and move two others. This really is a room built around a pool table! Click on the image (originally from MS PowerPoint) to enlarge. Here're three friends that helped hoist the plates into position. Thanks Pete, Joe, Morgan and Woody (not pictured) for pitching in. Note the long drill bit coming from behind This precision drilling was done by eye for each of the many bolts that complete the sandwich. 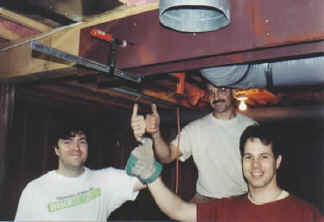 Joe (middle) was the structural engineer with the original idea for this non-intrusive method of supporting the house without taking the first floor apart. By the way, this picture was shot under the future location of the "Diagonal Wall". Their hands practically mark where the grouper is! This leads us to the "moment of truth". Removing the now unnecessary columns out from under the steel. 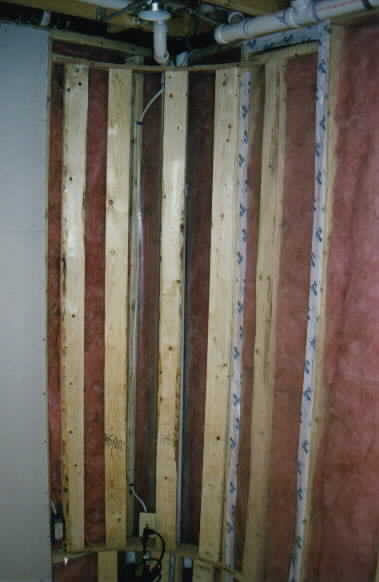 First, two temporary columns (in blue-gray) are used to take the house load off. Then each column was cut at its bottom completely through the steel jacket, and the concrete fractured at the same point with repeated blows from a sledgehammer. After about 5 minutes of full swings, the column would come out and the temporary columns removed. 2 years later and no problems - even with significant snow loads channeling down through these beams. The next task, therefore, was to rebuild the ductwork system so that it was as unobtrusive as possible. I decided to route it just inside the wall for the bathroom so that it was part of the wall - forming a soffit in that room and then emerging as part of the beam that needed to be covered anyway. In this way, I would have plenty of clear ceiling space in the middle of the two main sections of basement. If you click on this image to enlarge, play particular attention to the sprawling mess of ductwork tools, scraps, and insulation bits. This picture is what is behind the bar for plumbing infrastructure. 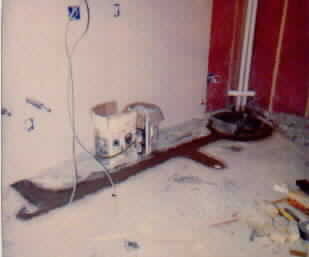 The fresh concrete shown is covering the drain pipe from the sink to the pump basin sunk into the floor three feet. 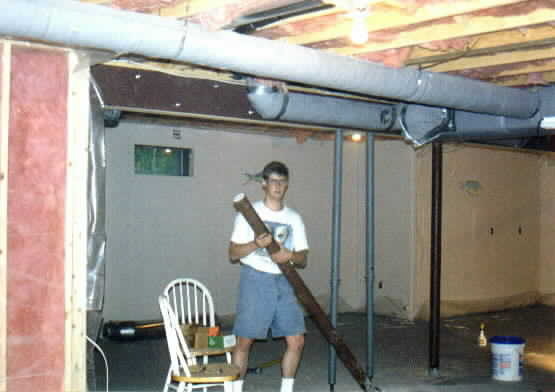 The vertical pipes on the right side of this photo are 1) the output of the pump that pushes the drain water back up to the level of the house drain, and 2) the vent pipe for the basin itself which ultimately runs up through the next two floors of the house and ties (in the attic) into a venting system through the roof.